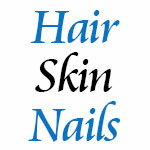 Hair, Skin, Nails : Beware of Parabens? A growing body of evidence suggests that parabens are estrogenic has convinced many manufacturers to reduce their use in topically applied products. Parabens comprise a group of alkyl esters of p-hydroxybenzoic acid widely used as synthetic antimicrobial preservatives in cosmetics, pharmaceutical products and food. Although most effective against molds and yeasts, parabens exert a broad spectrum of antimicrobial activity over a wide pH range. Parabens individually, or in combination, are employed in all cosmetic product categories, with reported use in over 13,000 formulations.3 Products containing parabens may contact the skin, hair and scalp, lips and nails. Parabens are non-irritating and non-sensitizing when applied to normal skin. However, application to damaged or broken skin may result in sensitization. Parabens formulate well because they have no perceptible odor or taste, do not produce discoloration, and are practically pH neutral. Parabens have been added to food for more than 50 years and their usage steadily increased to include more food categories, like soft drinks and frozen dairy products. Methyl and propyl are the most extensively used in foods, and FDA has affirmed them as Generally Recognized as Safe (GRAS) for direct addition to food at concentrations below 0.1%.7 A 30-fold increase in use of parabens was noted from 1960 to 1970. How much is considered to be safe? In a very recently published report, parabens are shown to elevate estrogen levels through inhibition of estrogen-metabolizing enzymes in the skin.19 Although the assessment of possible paraben estrogenic hazards on the basis of current studies is still equivocal and more research is needed, it seems to be an intelligent choice to avoid parabens by choosing paraben-free personal care products. 3 Soni, M.G., et al. Safety assessment of esters of p-hydroxybenzoic acid (parabens). Food and Chemical Toxicology 43, 985-1015 (2005) and references cited therein.